We think of indoor cats as leading a pampered and safe existence. But a new Swedish study finds indoor felines have high levels of brominated flame retardants in their bloodstream. The study is important because it's not only cats who spend a lot of time exploring their homes and putting things in their mouths. Children do the same, researchers at Stockholm University noted. "The brominated flame retardants that have been measured in cats are known endocrine disruptors. It's particularly serious when small children ingest these substances because exposure during the development can have consequences later in life, such as thyroid disease," said Jana Weiss of the university's Department of Environmental Science. Brominated flame retardants are added to textiles, furniture, and electronic equipment to prevent the material from igniting, but they are seen as health hazards and some are suspected endocrine disruptors. A number of them have been prohibited in products like electronic goods. However, they are extremely persistent and can leach from the products for many years after they have been produced, ultimately becoming part of the dust that is eventualy inhaled by humans and household animals. The Stockholm study is said to be the first to find evidence that household cats are exposed to the chemicals found in electronics and furniture. 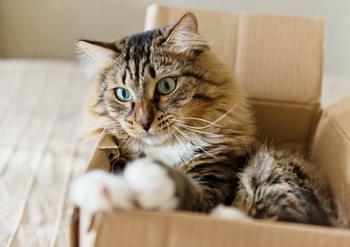 In a previous study, the researchers demonstrated that brominated flame retardants were found in higher concentrations in the blood of cats that had developed Feline hyperthyroidism compared to healthy cats. Now, new measurements of healthy cats establish their dust exposure. Paired samples were taken from the same household -- meaning that they took both dust samples and blood samples at the same time. "By taking paired samples, we have greater insight into the environment that the cats live in. Moreover the cats in the study spent the majority of their time indoors and therefore air and dust in the home is expected to contribute more than the outdoor environment," Weiss said. The study has been published in the journal Environmental Science & Technology.